It’s fish fry season. 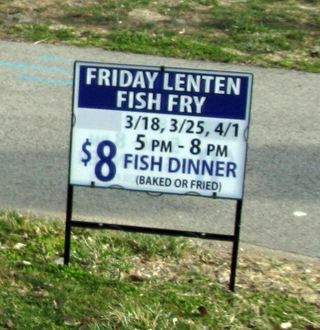 On any given Friday during Lent, at just about every Catholic Church in the metro area, you can find a fish fry. And take my word for it when I say the number of parishes in St. Louis and surrounding areas is staggering! We don’t eat out with the kids. Ever. Unless you count McDonald’s as eating out, which I do not. This is just not a situation that we have been wanting work through right now. But we know we really need too. 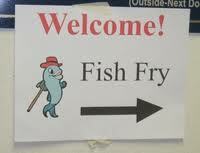 So, why not try a fish fry? It’s families. It’s casual. Right? We talk about where we’re going and a little bit about what to expect. I try explaining to Henry that it will be a little like eating in his school cafeteria. We have assured the kids that this fish fry also serves some pretty darn good cheese pizza and there just might be some yummy desserts to choose from if everyone eats their meal. We arrive early at our destination to avoid the big dinner rush and head inside. Grant and I are leading the way with all three kids behind us. We scope out the lay of the land and see that Grandma has saved us spots at the end of a long table in case we need to make a quick exit, yet right near the big dessert table to perhaps provide some motivation if needed. Perfect! As we head further in I notice that Lucy is right next to me but I don’t see Henry or Molly anywhere. Slightly panicked I start scanning all around and finally head back through the doorway where we first came in to find Molly squatting down talking to Henry. He doesn’t want to go through the doorway to this new place. He put the brakes on immediately at the doorway and would not go a step farther. Molly is handling it beautifully and she gestures for me to step back while she talks with him. After a few minutes, Molly waves me back to where they are and passes the baton to me where I immediately hand it off to Grant. After a few more minutes pass even Dad is unsuccessful in getting him to move father inside. “Let me try.” I say. Just like that we get in line, order our food, get drinks and sit with Grandma to eat. Henry just had to process the whole situation. I was exhausted! After finishing his entire pizza, Grandma offers to take him over to the dessert table. He takes his time looking over the many choices and when finally he makes his decision, Grandma hands him the money to pay. Henry quickly devours his cake and asks if he can have another. After all his hard work to not only get himself in the door but then also sit well at our table and eat, I was not about to deny him. I get up to walk over with him. The experience of choosing something and then paying properly for it is another area that we have not really worked on. With Grant sitting next to me telling me to let him go already, I hand Henry the exact change he needs and then held my breath never taking my eyes off him. I’ll admit here that the dessert table was maybe 10 feet from our table. It might as well have been 10 miles as far as I was concerned. We watched him walk along the long table again browsing the possibilities. Some boys were playing a video game nearby and we giggled as Henry got a bit distracted and went over to see which game they were playing. With only one simple verbal prompt from me, Henry was back checking out the desserts. I watched him make his selection and hand his money to the lady working the table. Henry walked back to his seat so proudly! It was at this point I think I started breathing again. And tried to keep my tears of joy in check! It was nearing time to go but Molly told us that she promised to take the kids to the playground after dinner so off they went. Grant and I were enjoying our beer and some kid-free, adult conversation. We weren’t really paying attention to the time. We had been pushing it to begin with so we should have known better. Sure enough, about 15-20 minutes later, here comes Molly practically carrying Henry back in to the cafeteria in complete meltdown with Lucy dutifully following. We had been there too long. I felt awful that one of us had not gone with them so Molly would not have to deal with that on her own. Again, she handled the situation very well. As best anyone could under the circumstances. We scooped up our tribe and made a fast, albeit LOUD and embarrassing, exit. Although the experience didn’t actually end well, I felt we took some big steps! We pushed the boundaries of our Kansas and had some huge successes! Experiencing public meltdowns (or the anticipation of the potential for one!) is definitely outside the borders of my own comfort-zone. I am learning that it is so important for ALL of our family to continue to expand our individual “Kansases”. Although next time maybe we had better pick a different parish. 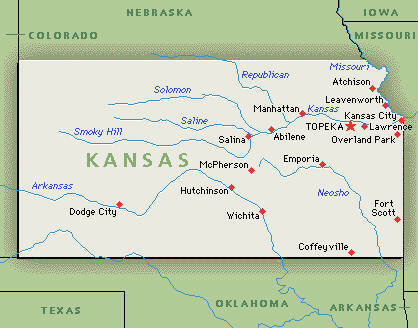 Perhaps one in the actual state of Kansas.